The last 10 days have brought some cooler weather on Lake Okeechobee. It has been refreshing, but the bass are still biting and we are still catching them! Water temperature has dropped and is now in the low 70’s and the clarity around the lake is good. The winds have been from the Northeast 5 to 15mph. The water level is now at 12.87 feet. It has dropped about 4 inches from my last report. The new moon just passed and so far I have had some beauties caught out there. What I have been doing lately is flipping in the morning. When the day warms up, I have been using a swim jig on the spawning flats. As always, the wild shiners are a trophy bass favorite. 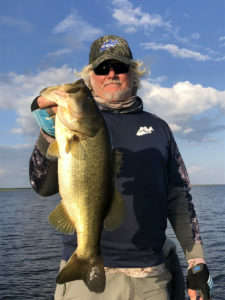 Good areas to fish have been Kissimmee River, Northwest corner and the East side of the lake. If you have any questions or concerns about Lake Okeechobee bass fishing, please call me. I will be more than happy to share the latest information, photos and catch details with you.